Though universally celebrated for its orchestral effects, the "Queen Mab" Scherzo from Berlioz's Romeo and Juliet has otherwise attracted little attention in the literature on Berlioz. On the contrary, the airy wit of Berlioz's scoring has been understandably regarded as the raison d'être of the Scherzo, together, of course, with its traditional symphonic role as a dance-like third movement.1 Once we probe beneath the surface of the orchestration, however, this movement raises a number of questions concerning the scope and nature of Berlioz's aesthetic aims. Was Berlioz's programmatic intent more precise than that of painting a generalized portrait of the miniature fairy queen? Does his orchestration serve more than just an evocative purpose in the overall scheme of this movement? Given its function as a dance movement, how is the Scherzo organized? Does Berlioz follow some kind of Scherzo-Trio-Scherzo formula? The following analytical essay will attempt to answer these three interrelated questions by exploring the confluence of program and sonority in this movement. Example 1. Berlioz, Romeo and Juliet, Scherzetto from the Prologue, mm. 40-47. Orchestral, harmonic, melodic, and rhythmic foreshadowing of the "Queen Mab" Scherzo. Prick'd from the lazy finger of a maid. Then he dreams of another benefice. Which once untangled, much misfortune bodes. Mab, that tiny fairy, so light and so wary. Her waggon's cut from a hazelnut. She gallops night by night, thro' lovers' brains and haunts them. Beneath the stars' soft silv'ry light. O'er a soldier's neck oft she rides. And sleeps until the dawn of morning. Queen Mab, 'tis she, whose gambols caused all this uproar. And leads her back to th' ball. Au clair de lune, sous la tour. Sur le col bronzé d'un soldat. Et ronfle avec ses camarades. C'est Mab, c'est Mab qui faisait tout ce bacchanal. Et la ramène au bal. Other aspects of the total sound reinforce this orchestrally determined architecture. 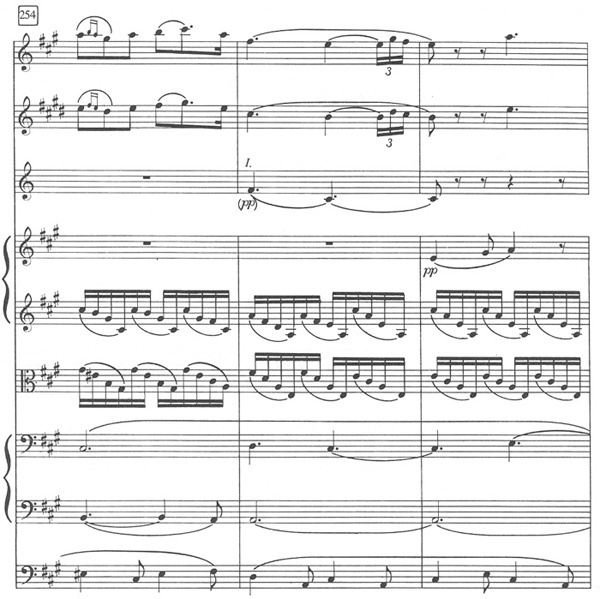 For example, from the start of Trio 1 (m. 378) the dynamics recede, the range contracts, the tessitura remains high, and a fragile, highly transparent sound is projected. Berlioz organizes these same parameters in a contrasting manner during Trio 2 (mm. 499-685). Here a long crescendo combined with unfolding range and an increasingly intricate textural web direct the flow of musical events. In Trio 3 (mm. 731-51), Berlioz plots yet another sonic course in contradistinction to both the Scherzo and each of the previous Trios. Dynamics drop back and groups of instruments call to one another in chordal antiphony. Example 3. Berlioz, Romeo and Juliet, Love Scene, mm. 250-256; flute and English horn against a string accompaniment. 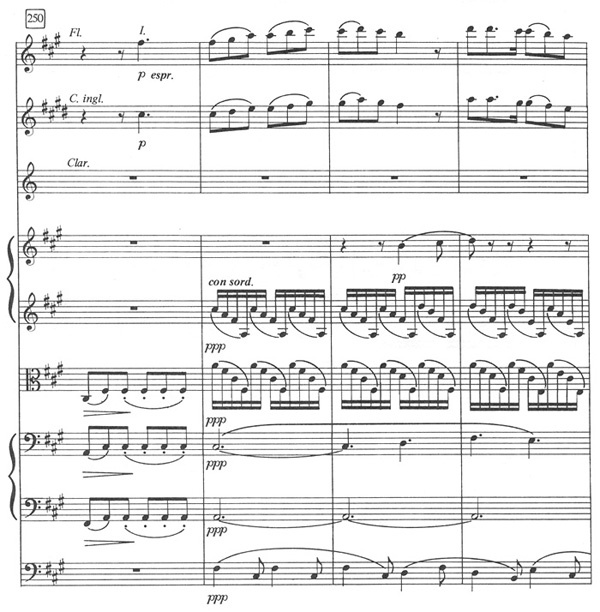 Taking a step back from the symbolism of Berlioz's orchestral detail, we find that he has ordered the long-range plan of this movement so that the three Trios described above recur in a progression of decreasing independence. The first Trio stands out as the most discrete of the three: the shift in tonality from F major to d minor/D major, the new thematic idea, and the changes in tempo and meter clearly mark the start of a new section.9 Similar departures from the Scherzo in both harmony and melody (a modulation to C major coincides with the entry of the horn motives) also signal the beginning of the second Trio. Here, however, the boundary-line between Scherzo and Trio is less sharply etched, because Berlioz continues the eighth-note surface rhythm of the Scherzo well into Trio 2 and also because he repeats the initial motive of the Scherzo precisely at the point where the Trio begins. Example 4. Berlioz, Romeo and Juliet, "Queen Mab" Scherzo, mm. 495-511: the partially disguised opening border of the second Trio. Least distinct of all is the boundary at the beginning of the third and final Trio. The gradual ritard and the decrease in dynamics make this brief Trio vague in identity. In many ways, it seems little more than a momentary slowing before Mab's frantic rush to escape the dawn. Example 5. Berlioz, Romeo and Juliet, "Queen Mab" Scherzo. The formal scheme of the Scherzos and Trios. Apparently the predictable layout of traditional dance-movement form seemed less than appropriate to dream sequences. The confluence of program and sonority outlined in the present paper represents more than just a passing phase or chance occurrence in Berlioz's style.10 Varied applications of this same combination, raising sonority to a level of structural significance, may be found in other works, offering equally rich analytical rewards to the curious explorer. 1See, for a typical example, A.E.F. Dickinson, The Music of Berlioz (London: Faber and Faber, 1972), 146, or Hugh MacDonald, Berlioz (London: Dent, 1982), 119, where he writes, "The scherzo (La reine Mab) . . . is Berlioz's supreme exercise in light orchestral texture, prestissimo and pianissimo almost without pause. The scoring is extraordinarily inventive. . . ." Berlioz himself unwittingly contributed to this tradition. When talking about this movement, he invariably mentioned the orchestration, usually because of the performance difficulties it caused. See The Memoirs of Hector Berlioz, trans. and ed. David Cairns (London: Victor Gollancz, 1969), 311, 340. 2Even these more obvious interrelationships between the Scherzetto in the Prologue and the Scherzo movement often pass unremarked. Dickinson, The Music of Berlioz, 148, treats the Scherzetto as material heard once, i.e., as without meaningful connection to the later movement; or again, MacDonald, Berlioz, 117: ". . . the foretasted scherzo [i.e. the Scherzetto in the Prologue] is not the same as the fourth movement (except the final flourish); it is a 'scherzino' or 'scherzetto' (Berlioz used both titles) in 2-4, with the tenor soloist and semi-chorus giving a deliciously light picture of the Queen of Dreams. . . ."
3We do not know enough about the details of Berlioz's collaboration with Deschamps to gauge the extent to which the changes in the Shakespearean text are a direct reflection of Berlioz's own suggestions. It is also possible that these changes derive from the Garrick version of Romeo and Juliet upon which the tomb scene was based and which was not available to the present author for purposes of comparison. 4The Shakespeare text is taken from The Penguin Shakespeare, ed. G.B. Harrison (London: Wyman and Sons, 1937). 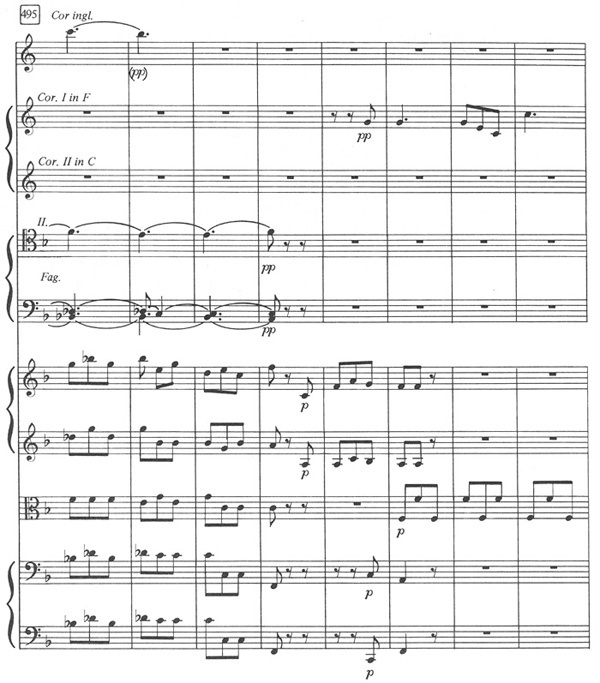 The Berlioz is translated from the French by John Bernhoff and appears in the Kalmus miniature score of Romeo and Juliet (Kalmus Miniature Scores 502). 5This interpretation differs sharply from the usual assumption that the movement is organized in a simple Scherzo-Trio-Scherzo pattern. See Dickinson, The Music of Berlioz, 150-51. Interestingly, MacDonald comments on a "genial snore on horn and bassoons" evoking the lines "Athwart men's noses as they lie asleep" (119). He does not, however, develop this line of thought. 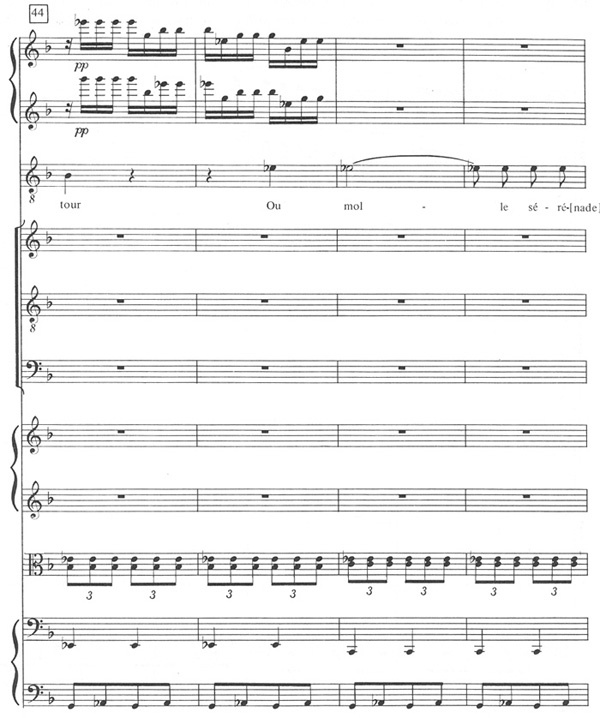 Furthermore, in discussing the programmatic role of the Trios, we should not overlook Berlioz's own subtitle for this movement—"The Fairy of Dreams." 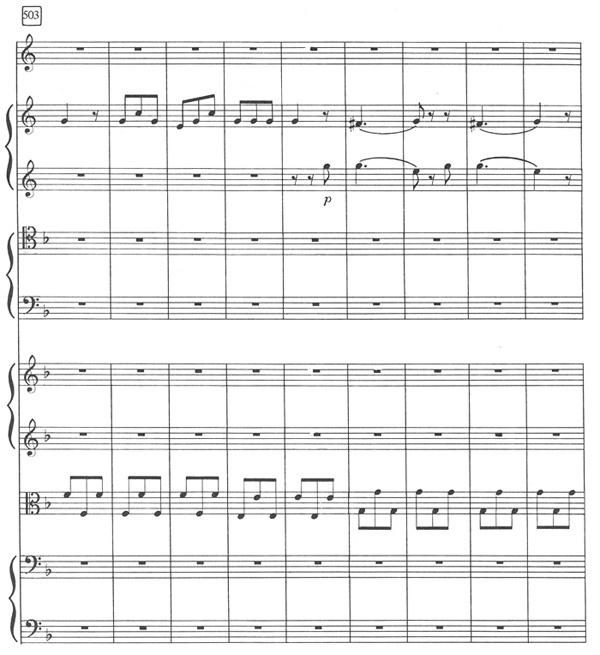 6The third Trio does not seem to convey any specific orchestral references, although the antiphonal exchange in strings and winds, coupled with the frequent fermatas, may possibly refer to the orchestral sound at the end of the Love Scene (see II, mm. 375-89). 7Hector Berlioz, Treatise on Instrumentation, enlarged and revised by Richard Strauss, trans. Theodore Front (Melville: Kalmus, 1948), 184. 8Berlioz, Treatise on Instrumentation, 29. 9In an interesting study of Berlioz's use of rhythm, Philip Friedheim suggests that Berlioz associated different meters with different emotional states. According to Friedheim, 3-8 signifies the impish and playful, while 3-4 (which Berlioz introduces at the start of the first Trio) expresses more intense and passionate feelings. See Philip Friedheim, "Berlioz and Rhythm," Music Review 37 (1976) 5-44. 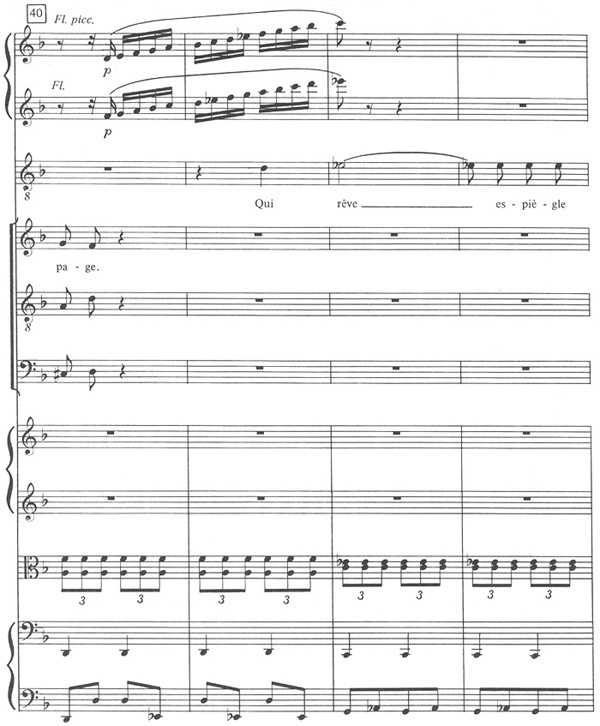 10This specific formula (S T1 S' T2 S" T S'''), with Trios of varying length and clarity, does not appear in Berlioz's two earlier symphonies—the Symphonie fantastique and Harold in Italy. In the former work, the dance movement is organized in an ABA-plus-Coda plan, and in Harold as an S T S T-plus-S arrangement. Since Berlioz's formal schemes are always clearly attuned to the changing programmatic content of his works, this structural variety is not surprising.